January | 2012 | Right Here..... Right Now.... Glory Be! Of Hot Tubs and Geese and …..
Last summer we installed a hot tub. I had been wanting one for years, but settled for the occasional soak in motel hot tubs while on vacations. It soothed my achy joints and ironed out the kinks in my muscles. But I didn’t think it was affordable for us. Finally last summer, we got serious about a hot tub. And in June it was delivered and installed. It’s a small tub, only holding two persons. So it’s not a party tub, but I love the intimacy of just The Hubs and me relaxing there by ourselves. The grandkids enjoy it, and they are small enough that all of them plus me can fit. And it’s not a tub with lots of bells and whistles. It has two speeds of jets, and a blue underwater light. That’s it: no strobe lights, bubble makers, or seating for ten. A cousin enjoyed his tub first thing in the morning, along with a cup of coffee. My favorite time is late afternoon or evening, to relax away the work-aches of the day. I keep a pile of beach towels in the sun room. After changing into my suit and donning a white terry robe and sandals, I grab a couple of towels on the way out. The tub is on the south side of the deck, and I can step from the deck into the tub. But if I am by myself, I enjoy just lifting one side of the cover and slipping in. Ahhhhhhh……. the 104 temps are the first responders to my tight muscles and aging joints. Then the jet starts massaging. I tend to just lay back and let it do its magic. I like to stare up into the night sky, finding the constellations or watching the wispy clouds in the afternoon sky. I pray and meditate. I make up conversations of things I wished I had said. I compose the beginnings of wonderful stories and poetry. And that brings me to today. It’s late afternoon; the towels and robe are laying by the tub and I’m leaning back on the built in pillow, and just floating. My eyes are shut, and I’m half asleep, with random thoughts meandering thru my head. It’s been a long day of heavy duty cleaning and laundry, and I was enjoying my bubble jet massage. Suddenly I heard a “SQUAAAAAAKKKK HOOOOOONNNNNK”, and jumped. A long uneven V-formation of geese is flying over. “Oh please,” I whispered, “don’t diddle on me.” I had a horror picture of having to drain the hot tub, in January, cleaning the goose doo out, refilling the tub…. I could envision the ice patches where the water drained. But the geese passed with no problem, and I settled back into my steaming tub and closed my eyes. Then I felt it: a wet cold splat hit my lip. A lone straggling goose must have let one go! I jerked up, wiped my lip and opened my eyes. To my relief, no goose was in sight, and nothing was on my finger. But what I did see surprised me: snow. The sky had been gray, but I didn’t anticipate snow. There was something very relaxing in sitting in a steaming hot tub during a snow storm. Something very ying-yang about the stinging pellets of snow mixed with the wet gloppy flakes hitting my face, while the rest of me was safely underwater. I am not a fan of snow; if you have read previous posts, you are aware of my antipathy and snow-aversion. But this was different. Sort of a rock-paper-scissors moment: hot tub melts snow…. Friends had told me that the best time to sit in the tub was during a snow storm. They were right. It was wonderful. Father, I thank You for inventions like hot tubs. I thank You for the opportunity to relax and unwind. I thank You that You provided the means for all this. You are so awesome, Lord! Your world is so awesome! I praise You….. In the Meantime…. In Between Time…. This may be the shortest post you will ever read from me. It’s based on some thoughts I have had from our sermons at church, our small group discussion, and my personal Bible study. Testing testing… Just checking to see if my posts are being hooked up to Face Book. Nothing profound in this post. But I invite you to check out the rest of my entries. 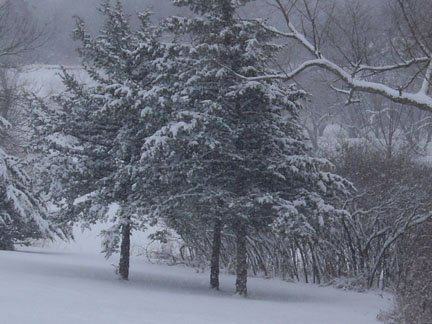 Latest one is this morning’s post about Iowa winters. Above the buffet in our dining room hangs a framed painting of a farmstead swathed in snow, with a lonely horse and buggy going past it. When we moved to Iowa from Missouri, our dear Sunday School class bought this and presented to us as a going away gift. They thought it represented Iowa: farms, snow, and Amish. And they were right…. Note that I don’t say much about the beauty of snow. I will admit to the initial beauty of the snowfall, the pristine sparkle and gentle curves of the drifts. The attached photo is the view from our front door, and there is beauty in it. The winter view from our front door. But the realities of living in it shadow those memories. I found snow to be cold, inconvenient, and dangerous. I didn’t have the luxury of sitting inside and just looking outside. I had to be outside in it. And I disliked almost every minute. Snow isolated us on the farm. That honestly did not bother me too much. I’ve always enjoyed the company of my own head, and my family was big enough and creative and active enough that we entertained ourselves well. The aforementioned Monopoly could occupy days, and our house was full of books and other games. My mother was a genius in the kitchen and we would gather there and experiment with new recipes. We had an old piano and would gather around and sing. And then Mom had all sorts of jobs for us that occupied our time. But unfortunately, on a farm, one cannot remain indoors all day. The animals must be fed, watered, bedded, milked. Eggs must be gathered. Like it or not, we had to bundle up, shovel out, and care for the livestock. Snow was deep in my growing up years of the 1950s. I was sort of a tiny slip of a girl, and so my memory perspective was of huge drifts, and of trying to walk in my father’s footsteps as he broke a path for me to country school. I shuddered in the strong winds, and shivered as the temps plunged far below zero. My breath turned to ice on the scarf that wrapped around my lower face, which resulted in a raw rash on that half of my cheeks. In those days, I wasn’t driving, but I remember riding in the car as my father drove, and being hypnotized by the huge flakes blowing straight at us….. looking very similar to Star Wars as they go into warp speed. I remember sliding in vehicles down hills and spinning around on the roads. My father was careful, but I was petrified. As winter wore on, and spring approached, the gray gritty dirt on the snow obscured any beauty that it might have once had. What would melt in the day, turned to black ice at night. Then it turned to puddles and rivulets of muddy water that splashed up on cars and humans alike. The black grime covered the white salt residue on the car sides. Snow might last from October to April. I hated it, and could not wait to leave for somewhere with better weather. So I went south…. all the way to Kirksville, MO! And honestly K’ville was no better. Students jokingly called it the armpit of MO. There was just as much snow and ice and cold. The difference was that North East MO State U did not call off classes…. One of my boyfriends there drove a little white car. One snow one night covered his car, and melded it into the snowy landscape! Then I moved even further south…. all the way to the St. Louis area. And now there was a difference. This area was in a completely difference growing zone. Fall was longer; winter was shorter; spring came earlier. I loved it. There was still snow, but not as much. The temps were a little milder. And as a teacher, I didn’t have to get out on snow days!!! Perfect!! I remember once during my first year teaching there asking my creative writing students to visualize a blizzard, and to write the sounds and sights of that snow storm. They sat without moving or writing. When I encouraged them again to begin writing, one said, “I’ve never been in a blizzard.” The others nodded affirmation. Ah…. Welcome to the south! Wouldn’t you know it; that winter we had heavier snow than any of the natives could recall! Alas…. all good things come to an end. Two years ago, we moved back to Iowa. It was for good reasons, and it was the right thing to do. But besides missing all our great friends, and our great community and church, I missed the weather. Our first winter back in Iowa was a shocker. We had a 4 foot drift in the backyard, and didn’t see the ground for a couple months. We huddled by the fireplace and shivered. I owned no boots when we moved here, and stepping outside meant snow down my socks. What a welcome-back!! I’m becoming climatized again to Iowa, but still dread the winters. Today I look out the window at blowing drifting snow. The air is that strange misty white color: no sun drenched golden colors coming through the window panes. It’s single-digit-cold outside, and the fireplace is my new best friend. The sense of isolation is still with me, but not as intense as it was in my childhood. We live in town now, and I can see some cars nervously venturing up the street. And because we have no animals outside, I don’t have to step out for any reason. I can even leave the mail in the box until tomorrow! Bottom line: I still hate snow. I still hate winter in Iowa. But I’m here, and I’ll deal with it. Father, You made the seasons on purpose, and for our use and for Your glory. Help me to use this season to reflect more on You Help me to see more of the beauty and less of the drudgery. Forgive me for whining about the snow, and help me see the blessings of not having to be out in it. And I ask that You protect those who out clearing the roads, and be with those who must be out driving or working in this weather. I am in the autumn of my life span now; spring and summer are behind me. Teach me this winter what I need to know about the winter of my life. Our eight year old grandson, Bradden, called us five times yesterday to ask questions about his illness. Me: (gross picture forming in my head). I’m so sorry, sweetheart. I know he probably means that he had diarrhea and now he is in bed. Grandmas just have to interpret these things. Bradden: I puked up my popsicle; I puked up my pill; I puked up my ramen noodles. Grandma! What do I do??? My ready answer is to sip water and more water, even if you throw up again. I have this horrible vision of little dried up guts and cracked innards because of dehydration. Now…. I am not a doctor, nor do I play one on television. But for some reason, my family comes running (or calling) to me when illness strikes. They expect me to don my white lab coat, hang my shingle, and diagnose and prescribe. But honestly, my medicine woman skills are limited to “drink more water”, “soak in a hot tub”, and “take a nap”. Not very high tech, eh? My mother was a much better medicine woman. She would look at my brother’s ears, pronounce them to be red on the tips, and therefore my brother was sick. “You’ve got red ears, Brother. You must be sick.” She was a master of temperature. “Put on a sweater; you are cold.” Hot packs, cold packs, thermometers, sweats…. all part of her medicinal vocabulary. I spent much time in bed with nasty Vicks rubbed on my chest and watering my eyes, and a hot water bottle wrapped in flannel topping it all. I had to swallow this nasty stuff called “Beef, Iron, and Wine” from Rexall drugstore that gagged me, but was supposed to stimulate my system. But despite all these remedies (or maybe because of them), I lived!!!! My personal medical routine is pretty simple now. Every morning I take a handful of vitamins and supplements, and eat fish. I take a hot tea break in the afternoon. I work out at the gym 4-5 times a week. I try to watch my weight (a never ending process…. sigh…), and go for regular check ups to my doctor and dentist. I try to have an optimistic attitude and a healthy spiritual life. But if I start to feel puny, or my joints hurt, or I have a headache, stomachache, leg ache….. then I soak in the hot tub. There is nothing like a hot tub for total relaxation. It’s my physical therapist, psychologist, doctor, chiropractor, masseuse…. all in one! I wrap up in my swim suit and robe and grab a couple of towels and it’s off to the back deck to just slide in and say “ahhhhhh….. oooohhhhhh…..” as my muscles melt and my troubles just slide away. Just give me 15-20 minutes there, and I am a new woman. Hubby’s major item in his medicine kit is a nap. He swears that it cures whatever is wrong with him. And he has the uncanny ability to nap anywhere, anytime. Me? I’m wound a little too tight. But I’m beginning to appreciate his drug of choice, and occasionally slip in a nap myself. And I must admit: I feel better afterwards! Finally, there’s the “drink more water” prescription. Somehow, I just keep thinking that if I can flush this virus, this bug, this bacteria, this poison out, then all will be well. And the fact that it makes me get up more in the middle of the night just adds to the exercise, right? So…. how’s my health? Well, I’m of Social Security age, and I don’t wear glasses or contacts. I’m losing my hearing, and my hip joints ache at times. I have allergies. My cholesterol is on the high side of normal. That’s about it. Maybe I should prescribe another soak or nap. And when the grandkids call, I’ll still suggest water…..
Father, I praise You for the gift of health. Despite all that I do, I know that it is not of myself. It is a gift, and I only try to maintain the gift. Forgive me for the times that I do not care for myself as I should.